Instagram(s fb) was the company that has perhaps best pioneered the launch of a successful, truly mobile-first social network, but after Facebook bought the company, a web future seemed inevitable. Instagram launched a desktop photo stream on Tuesday, allowing users to scroll through photos of users they follow just as they do on the mobile stream. But it seems the app hasn’t strayed too far from its original roots: the photos still need to come from your smartphone. Instagram launched desktop profiles that allowed users to view their own photos in a grid-like layout outside the mobile app in October. The addition of a desktop feed creates serious growth and monetization opportunities for Facebook — it spreads the influence of Instagram far beyond the iPhones where the app started, and it sets the company up for greater advertising options, which are still more profitable on desktop than mobile. The move comes at an interesting time, as Facebook works to emphasize its mobile qualities — it finally has more active users on mobile than desktop — but for Instagram, reaching a wider audience means moving to every available platform. Since our launch in October of 2010, we’ve focused on building a simple app that has inspired creativity while capturing everyday moments through the lens of your mobile phone. In fact, our focus on building out a mobile-only experience is a unique path that we’ve chosen for many reasons, the most important of which is that Instagram, at its core, is about seeing and taking photos on-the-go. However, to make Instagram even more accessible to our growing community, at the end of last year we started to expand to the desktop web, giving you the ability to see profiles from instagram.com. To continue that path, as of today, you can now browse your Instagram feed on the web – just like you do on your mobile device. Critically, users still can’t upload photos from the desktop. Sure, they can interact with the Instagram photos by liking and commenting and displaying a profile, but the actual photo upload process remains mobile-only. The transition to desktop photo-uploading seems possible, since it would allow even more users to access and participate in the site even if they don’t have the app. But an Instagram spokeswoman said they currently have no plans to offer that. So for now, it seems the basic mobile DNA of Instagram will remain intact. Yes, it’s a bummer that we can’t upload … I would presume that since they have so many other sites just with the capability of viewing and interacting, that Instagram would at least provide an advantage to using their own platform from desktop. Maybe it’s in the works w/ them … ??? Very recently Instagram stopped support of an older version of Instagram and now gives me an error when I try to post, so unless there is a way to upload photos using the desktop interface, I guess I’m not using it anymore. the summary says facebook, isnt it supposed to say instagram? Eliza, I’m glad to see Instagram is sticking to its standard. “Instagram, at its core, is about seeing and taking photos on-the-go.” As an Instagram user, I don’t really enjoy scrolling down my feed and seeing images that people obviously did not snap with their mobile device but instead downloaded to their device and are uploading into the app. I’m a big fan of keeping Instagram full of on-the-go photos and not much else. 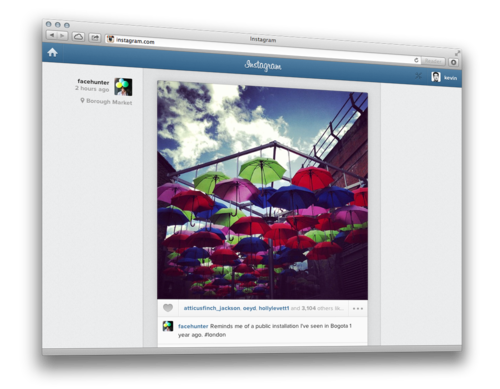 Being able to browse images or utilize social features of Instagram on the web or via desktop program makes sense.